This may not come as a surprise to anyone, but did you know that you can make popcorn in a microwave? Yes, shocking, I know. But what I dislike about buying bags of prepared popcorn ready to go into the microwave is that they are mostly filled with unpronounceable substances that I would not put in my body given a choice. They are also a ridiculous amount of money for what you get. This afternoon, I went out and bought a bag of regular popcorn for almost nothing. I placed a handful of kernels into a brown paper bag, folded up the top and placed it in my microwave oven for about 2 1/2 minutes. 2 and 1/2 minutes later, I was enjoying a bowl of cheap as dirt popcorn seasoned with my favorite smoked salt. I’m not as surprised at how easy this is as much as I’m blown away by the idea that I hadn’t thought to try this long ago. I’m sure many of you reading this may already know how easy this is, but this was my mini epiphany. Now I can make popcorn flavored with just about anything I like and I don’t have to take out the pot and oil, or pay more than movie popcorn prices for a simple bag of microwaved popcorn. 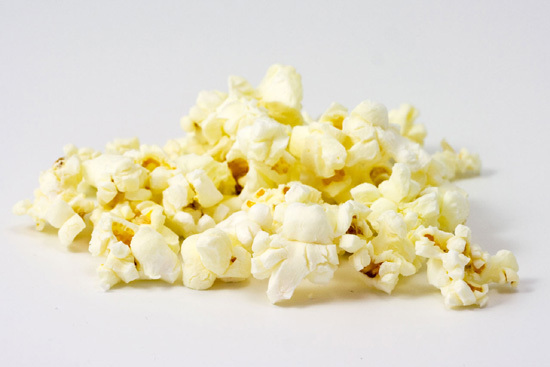 This is, by far, the simplest popcorn recipe I have ever come across and works incredibly well.